I enjoy everything about Habanos. I started working at Cubatabaco in 1984 and since then I have been in the sector for more than 30 years. The thing I most admire about Habanos is the passion that surrounds the product. From the farmer (veguero), who plants the seeds, to the smoker, who finally enjoys the cigar, everyone who touches a Habano falls in love with it. People from different cultures, creeds and ideologies can forget their differences while smoking a Havana cigar. I was born in the Pinar del Rio region of Cuba, so tobacco has been a part of my life since my childhood. Although I am from the Semivuelta zone, which is not known for its Vegas de Primera, I became involved with tobacco very early on. I remember going to the sorting house with my Mum, who used to work there, and I still have in my memory that particular aroma of cured tobacco that welcomes you when enter an Escogida. One of my favourite pastimes was to spend hours talking to my Dad while he was smoking his cigar accompanied by a cup of Cuban coffee. Then ,when I was a teenager I had the opportunity of participating in more than one harvest in Vuelta Abajo where I learnt to do different manual tasks like, for example, the sewing of the leaves in the curing barns. Tobacco is one of the main products that Cuba exports. At University I studied economics with a speciality in foreign trade, so to work in the tobacco sector was always in my mind. When I graduated I did not hesitate to accept the offer of working at Cubatabaco. Since then tobacco and especially Habanos, has occupied a special place in my heart. 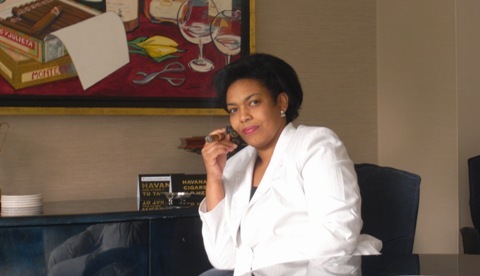 When I started working in Cubatabaco , my first job was in the purchasing department in charge of the buying from the H. Upmann & Partagas factories . At that time Montecristo No 4 was the star of all Habanos, and, as part of my training in the industry, to smoke a Monte 4 was an initiation ritual. However, I became a regular smoker only after 1992 when I started to be involved in the development of new products as part of my role in Marketing. I participated in the tastings of the new Cohiba Linea 1492 (the Siglos), which was very exciting. Every cigar is different and every smoker as well. To choose the proper time to have your first cigar is as important as selecting the cigar itself. I would recommend anyone who starts smoking Habanos to learn a little about the product first. This will help you to understand better the range of flavours and sizes and will be a good guide when choosing a cigar that will suit you. Trinidad is one of my favourite brands. I feel very close to it as I had the responsibility of working with the industry on the design of this brand in 1998. I collaborated with one of the most experienced Master Blenders in the Cuban industry, Raul Valladares, in the selection of the final blend that gave the brand its characteristic flavour and aroma . Amongst all the sizes, I prefer the Trinidad Reyes. I like to combine it with a Cappuccino at any time of the day. Cohiba is another brand that I like a lot. All the lines have an exquisite aroma and the extra fermentation provides to any of the sizes a most rounded flavour that enhances the characteristic sweetness of the Cuban tobacco. Among the sizes I prefer are the Robusto and the BHK54. Both are ideal to enjoy after a nice dinner and they combine perfectly with aged Cuban rum. Recently, the Ramon Allones Petit Belicosos Regional UK edition 2012 has become one of my preferred cigars. It is always well constructed with an intense but balanced flavour. I like it with a single malt whisky. To pass the Master in Havana cigars exam is a real challenge for anyone. To do so with a distinction has given me more confidence about my knowledge of the product. Joining the elite group of people in the UK, who have demonstrated such a deep knowledge about Habanos, is a great honour and pleasure. In return I hope that with my experience I can contribute a little to the forums and debates of the group.